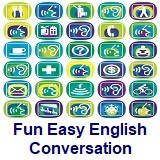 ﻿ Fun Easy English - new classroom free online classes english language lessons speaking listening writing reading april 9. 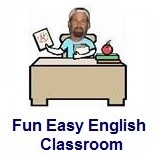 Today in the Fun Easy English classroom you are going to learn about personal subjective pronoun an important part of English grammar. Definition of a personal subjective pronoun. makes no distinction between singular and plural forms of "you"
Example: A person called and they did not leave their name. I went to the supermarket with her. She went to the supermarket with me. Personal subjective pronouns are words which simply replace a noun that performs an action in a sentence. John went to the supermarket with Jane, becomes, He went to the supermarket with her. Peter: There’s the shoe store we’ve been looking for. It’s just across the street. Gail: Wait! You can’t cross the street in the middle of the block! You have to cross at the corner. Peter: Oh, come on. Let’s go across here. Gail: Look out! You nearly got hit by that car! Now do you see why you should cross at the corner? Peter: I guess you’re right. I’ll be more careful after this. This is the “pointing out” there (the adverb, not the introductory function word), and therefore it receives a strong stress. A compound noun; therefore the first word is singular and receives the principal stress. This is the usual, natural way to say this, omitting the relative pronoun and putting the preposition at the end. The shoe store that we’ve been looking for is also possible. However, for which we’ve been looking is extremely unlikely in this natural conversational context. 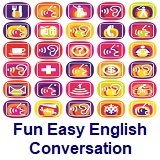 Notice how the present perfect progressive emphasizes the immediate, continuous nature of the activity. Meaning is directly across the street, exactly across the street. As used here, means something like Oh, don’t be so careful and scrupulous! 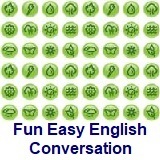 The phrase come on is frequently used to mean Hurry along. Don’t delay! 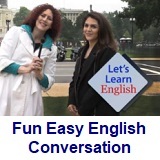 Note that the two­word verb come ON has the stronger stress on the adverbial element on. Meaning is be careful! Be alert! The phrase Watch out means the same thing. Meaning is I think (that).